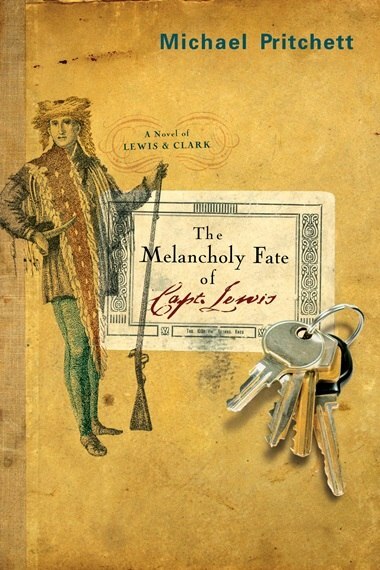 While writing a biography of his famous namesake, Bill Lewis, a high-school history teacher, nearly loses himself in his attempts to understand one of the great untold stories in American history—the adventures and subsequent suicide of Meriwether Lewis. Even as he struggles to illuminate that strange and exuberant time and and falls under the spell of the elusively seductive persona of Capt. Lewis, Bill finds himself fighting his own personal crisis, brought on by a clinical depression that threatens not only his book, but his job, his family, his 13-year marriage, and his own survival past the age of 40. In this rich, confident debut novel, Michael Pritchett not only authentically recreates the world through which Lewis and Clark forced their way, but also finds extraordinary parallels between Capt. Lewis’s doubt about manifest destiny and the contemporary uncertainty of the introspective modern male at a time when all our values are in question. “. . . About half are dead!” Clark said to his visitor, this Washington Irving, who was nearly as old as he himself. What did they want him to say, and why keep coming year after year when he only said the same things again? Everyone wanted to look into the matter, and always went away unsatisfied with his rote answers. “I saw him once,” this Irving, a famous writer in his own right, said. “At Burr’s trial. I didn’t know who he was at the time.” Clark waited for a question. Maybe these visitors just needed to talk about Lewis, and of the pain they felt, a flat, empty sense of having missed their own time.